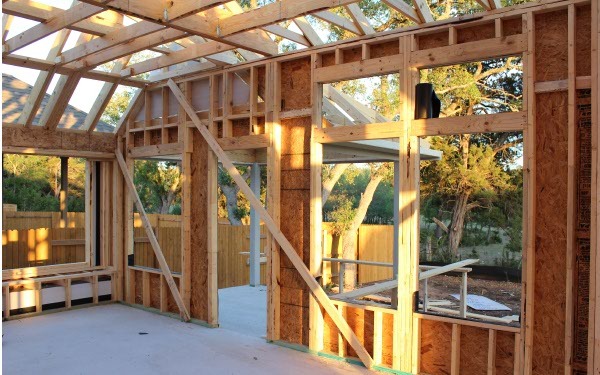 Framing a wall isn't too difficult, but there are a few things that are important to know before you get started. First, you must determine if the wall you are planning to build is a load bearing wall or a non-load bearing wall. The picture below shows two adjacent walls. They are both load bearing because they carry the weight of the roof and ceiling. There are headers over the doorway and windows to carry the weight of the roof and ceiling across the span of the rough openings. Temporary diagonal braces keep the walls square and plumb until the exterior sheathing can be applied. If you are framing basement walls in the interior of an existing structure, these walls are typically non-load bearing, and can have a single top plate. Load bearing wall studs are generally placed closer together (16" apart). Whereas, non-load bearing wall studs can be 24" apart. 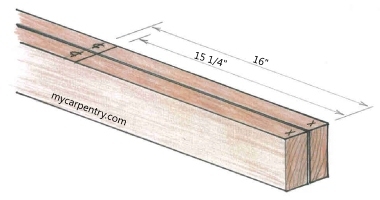 To lay out a wall for framing, cut the bottom and one of the top plates the length of the wall. Position the two plates on a flat surface so that the ends line up. Pull a tape measure from one end and make a mark at 16" (this will be the center of your second stud). Make another mark at 15.25" (this will be the location of one edge of the second stud). From this mark, make a mark every 16" and draw a line across both plates. Continue this process until you reach the end of the plates. Keep in mind the size of the materials that will be covering the wall when you lay out your studs. Typically, drywall and exterior sheathing come in 4' x 8' sheets. This is why the stud spacing of 16" and 24" work well for wall framing. Most walls will include windows and/or doors located at specific positions on the wall. In these situations, you'll need to add additional studs and framing. 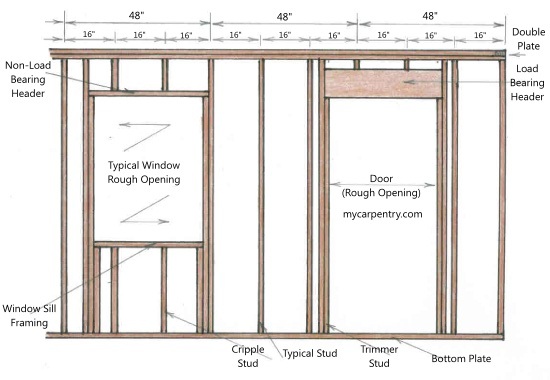 Regardless of the location of the windows and doors, maintain the common and cripple stud spacing as shown in the diagram below.